What is the benefit of IP-based bird box camera? The IP-based bird box cameras output pure digital video. You can direct access the bird box camera directly thru mobile phone, laptop, PC without involving any USB video capturing device. After the bird box camera is connected to your home network, you will be able to watch it outside of your home over internet. How do I setup my bird box camera for mobile phone? You simply just need to install our free app, scan the QR code on the box. Your bird box camera is ready to go. The app has eliminated the network setting on your router. It can locate your bird box camera with the cloud ID in the internet. Except for mobile phone watching, what else your bird box camera can deliver? Our bird box camera delivers 1.3 megapixel HD image. It is around 3-time better image than 700TVL ultra high resolution bird box camera. The WIFI digital signal is not easily get interfere as 2.4Ghz wireless. You can directly record the high-def image to the devices such as smart phone, PC, laptop without involving extra devices. How can I record the video from bird box camera? You can simple press the record button on the app, the live stream from bird box camera will be saved to your mobile phone. If you want long term recording the bird box camera, you need to install our free PC software, and record to any of your PC computer or laptop. The wifi bird box camera supports 128G TF memory card, you can simple insert TF memory card which is the same one you use on your mobile phone, the video will be saved to the TF memory card. Do I need to remove the TF memory card from my bird box camera to view the video? No, you never need to remove the TF memory card from your bird box camera for viewing the video. The free app or our PC software allows you directly view and download the recording video on the TF memory card. How can I upload the video from my bird box camera to Youtube? After you save the live to app of your mobile phone, you still need one step to copy the video files from our App to your mobile phone’s memory space. Then you can upload to the Youtube or post to instagram directly. The recording files is .mp4 format which is ready for social media sharing. Can my friends watch my bird box camera using their mobile phone? Your friends just need to install same free app. You will have to send them the QR code with the password of your bird box camera. Then your friends can watch the bird box camera on their mobile phone. The bird box camera supports max. 5 users online connecting at the same time. Do I need power for the wifi bird box camera? Yes, you always need the power for any bird box camera, no matter wifi or wireless bird box camera. We don’t recommend you use the battery solution, change the battery could force the bird leave the bird box. It is illegal to tap the bird box if there’s bird inside in UK. 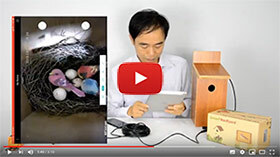 The WIFI bird box camera eliminates wiring the cable back to your home network. You can get DC12V power outside such as the backyard. How do I know the wifi coverage is good enough for your wifi bird box camera? Bring your mobile phone to the wifi bird box camera installation position, check the signal strength, if the wifi signal always stay good rather than poor, it is ready for wifi bird box camera, otherwise, you may need to relocate your wifi router or add an wifi extender to boost up the signal around the bird box camera. How to maintain the bird box camera? We advised you remove and store your bird box camera while it is not in use. If you want to clean the lens, use 75% alcohol and follow this instruction to clean the lens of bird box camera.